I work in an office where, despite being asked to "please keep the kitchen tidy for the next person", and a sign on the wall, some people still just continue to plunk their dirty dishes in the sink and expect someone else to do them. If you are at work, we assume you are probably old enough to do your own - we don't have an "office mommy"! Please be courteous and don't leave dirty dishes or a mess on the counter for the next person to have to clean up to prep their meal. This is just common courtesy in a communal kitchen - I don't know why people would need to be reminded! Pretty much a problem at every communal kitchen. There's always at least one person who thinks the rules don't apply to them or, "I'm too busy to clean up after myself right now. I'll come back and do it later." After awhile I end up just plunking the dirty dishes back on the offending person's work area. Every office I worked in with a kitchen had the same problem. I ended up using my own dishes and taking them home to wash. In the ME we had 'tea ladies' who were hired (at ridiculously low wage) to keep our kitchens clean and ALWAYS have a tea kettle available to make tea for anyone who wanted it. I still washed my own dishes. The tea ladies were lovely. Don't be a dork - clean up after yourselves - "It's nice to be important but it's more important to be nice." 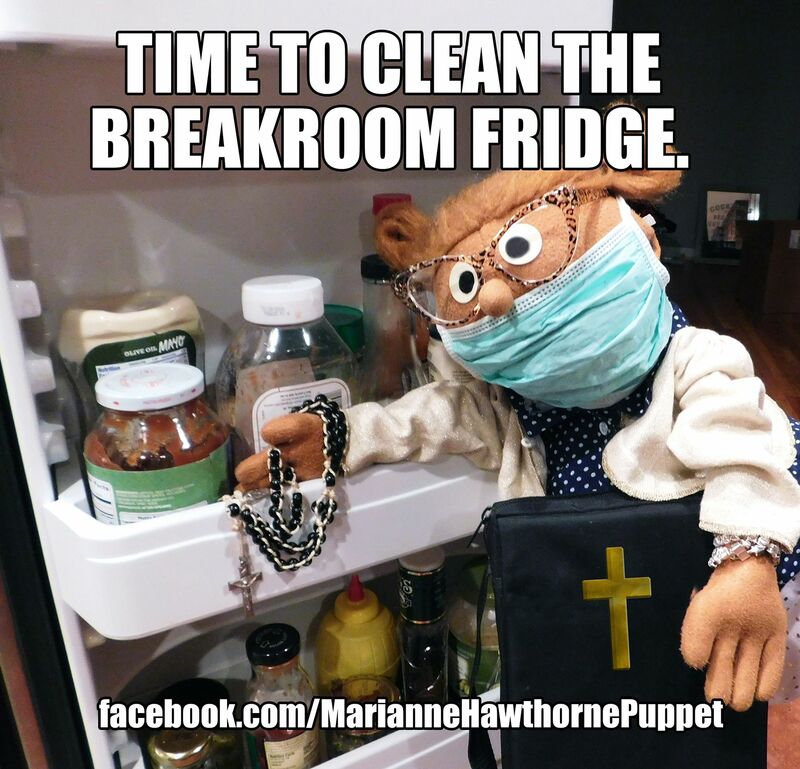 Second to the unwashed dishes is the unclaimed and rotting food left in the office refrigerator! ^^ I'd organize a game called " Name that food"
You can always double side tape their dishes to their office walls.